New York City always seems to be on the forefront of the latest culinary trends. So get ready, America, you might soon be drinking your cappuccinos from fresh bell peppers. The drink was recently introduced at the Chelsea coffeehouse Crave.It after the Italian master barista Ettore Diana dropped by to show the new café folks some of his tricks. 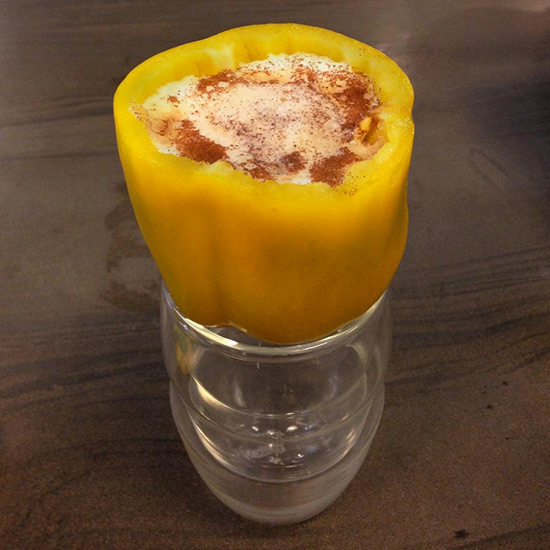 He introduced a number of his signature drinks, but none seems as interesting as his cappuccino served in a hollowed-out yellow bell pepper. In tasting the unique beverage, the NY Daily News’ Justin Rocket Silverman wrote, “Don’t knock this bell jar until you try it: The bitter kick of the coffee is perfectly balanced by the cool sweetness of the pepper.” It better; otherwise, you just look like some idiot who’s drinking out of a pepper! During his chat with the Daily News, Diana also took time to rate a few of America’s most common coffees. Surprisingly, he ranked McDonald’s over Stumptown. But I guess when you make a living turning bell peppers into cups, you’re willing to take controversial stands. Though Diana has since gone back to Italy, Eater has confirmed that his bell pepper beverage is still on the menu at Crave.It for now. Until God invents caffeinated vegetables, this might be the best option you have.